You’ve got to try this refreshing layer cake this summer! 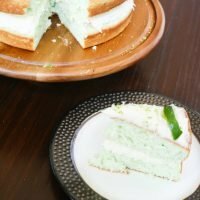 This Key Lime Layer Cake is made from scratch with a secret ingredient to give it a pretty lime color! Today I’m excited to join in The Great Wayfair Cake Off! 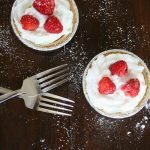 Wayfair selected a few food bloggers like myself to create a cake recipe using fresh fruit. One winner will be selected next week as the Great Cakeoff champion! 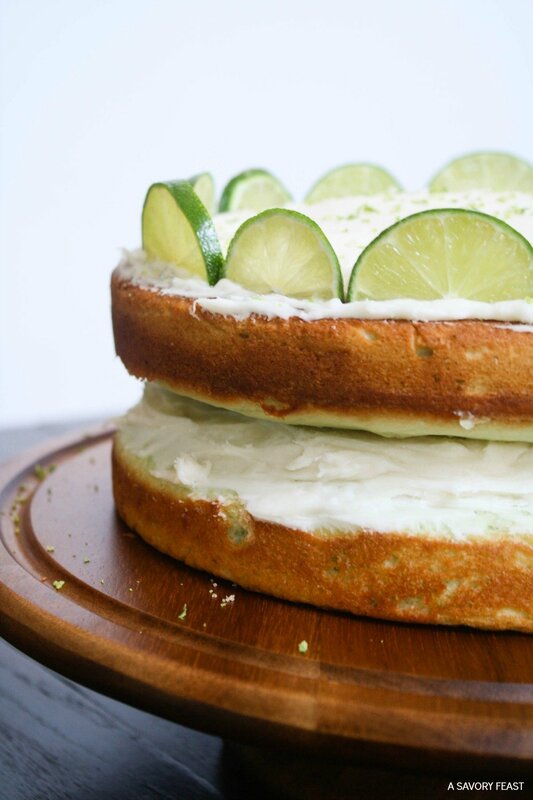 I’m hoping to win with my beautiful Key Lime Layer Cake. 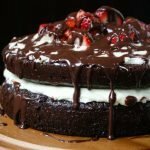 Earlier this year I shared my Strawberry Chocolate Ganache Layer Cake, and I’ve been dying to create another decadent layer cake ever since. I’ve got to admit, I’ve been dreading the hot Florida summer this year. 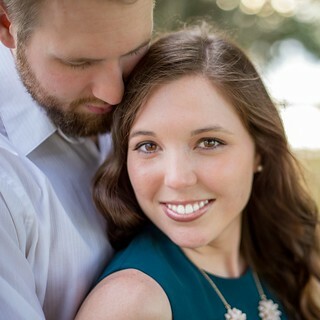 I just entered my third trimester of pregnancy, and it is no fun being hugely pregnant during the summer heat! But if anything can get me excited about summer, it’s this cake. One of my favorite hot weather desserts is key lime pie. I decided to use that same flavor to create a gorgeous layer cake. 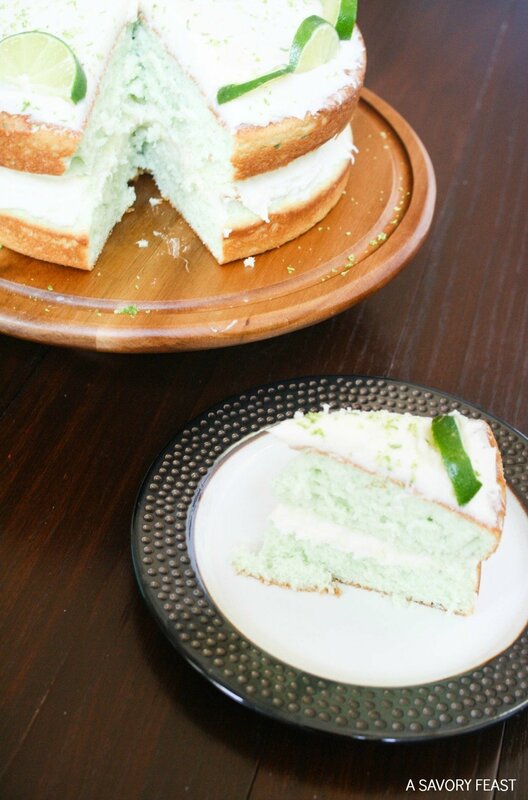 The layers of this cake are made from scratch and include fresh lime juice and a secret ingredient to give the cake a pretty lime color and extra pop of flavor — lime Jello! 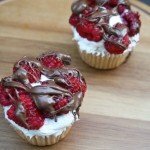 The frosting is also made from scratch using my favorite cheesecake frosting recipe. The result is a super sweet and slightly tart cake that will be a hit for any occasion. Creating and decorating layer cakes is so much fun! 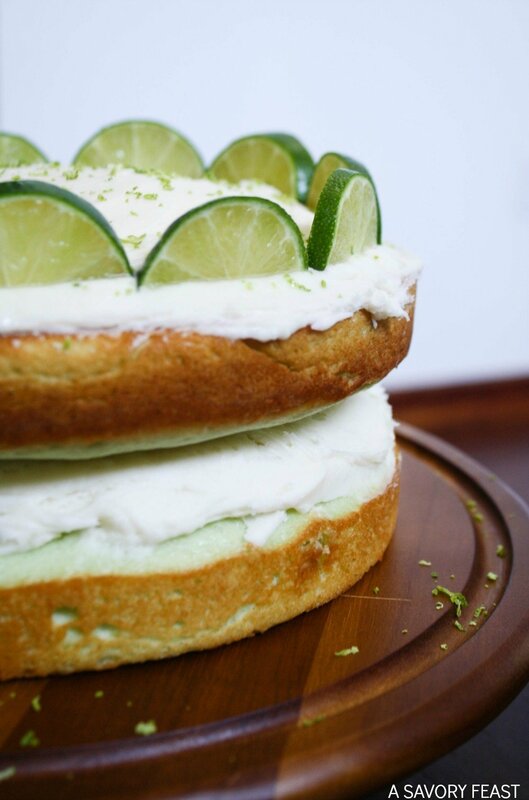 I topped this cake with slices of fresh limes as well as some lime zest. 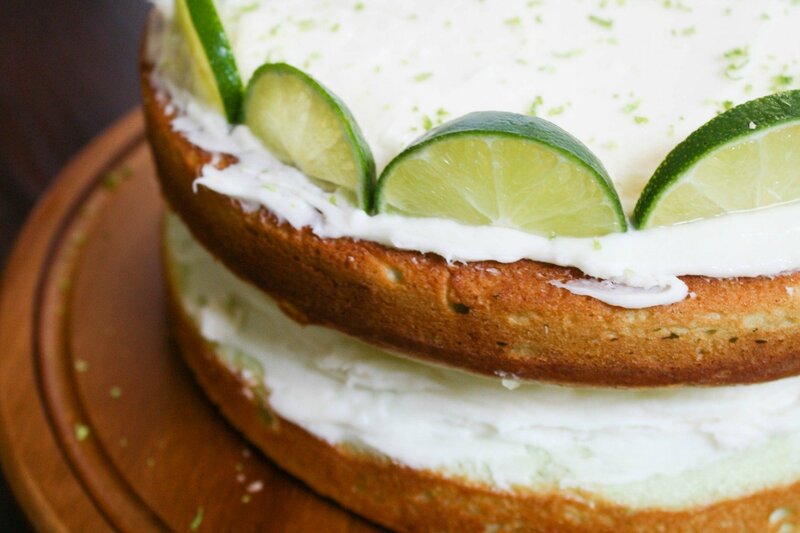 This adds just a hint of extra lime flavor to the top of the cake, too. Wayfair makes creating cakes like this so easy! I love their cake and pie serving dishes as well as their cake pans. 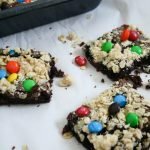 So grab a slice and celebrate the beginning of summer with me, heat and all! This cake is sure to cool you off. You've got to try this refreshing layer cake this summer! This Key Lime Layer Cake is made from scratch with a secret ingredient to give it a pretty lime color! Preheat oven to 350 F. Line the bottoms of two 9" round baking pans with parchment paper and grease sides. Zest both limes and set the zest aside to use to top the cake. Juice the limes and set aside. In a large mixing bowl, beat the butter and sugar together on medium speed for about 3 minutes or until fluffy. Add sour cream and vanilla extract, mix. Add in the egg whites in two batches. Make sure everything is combined. In a medium bowl, mix together flour, Jello mix, baking powder and salt. In a cup, combine the milk,water and key lime juice. Add half of the flour mixture to the large mixing bowl and mix until combined. Add in the milk mixture and mix until combined. Finally, add in the rest of the flour mixture and mix until combined. Divide the batter into the cake pans. Bake for 25-30 minutes or until a toothpick inserted into the middle comes out clean. Let cool in the pans for 10 minutes, then transfer to a cooling rack and cool completely. Place one layer of the cake on a cake stand. Spread about half of the frosting on top of the cake. Place the next cake layer on top of the frosting. Spread the remaining frosting on top of the cake. Garnish with lime zest and lime slices. Cake recipe adapted from Life Love and Sugar. Frosting recipe originally appeared in my Strawberry Chocolate Ganache Layer Cake. YUM! I pinned this so I can make it later. Looks soooo good. I hope you get a chance to try it! It’s soooo good! The combination of key lime and cheesecake is incredible! You will love it. 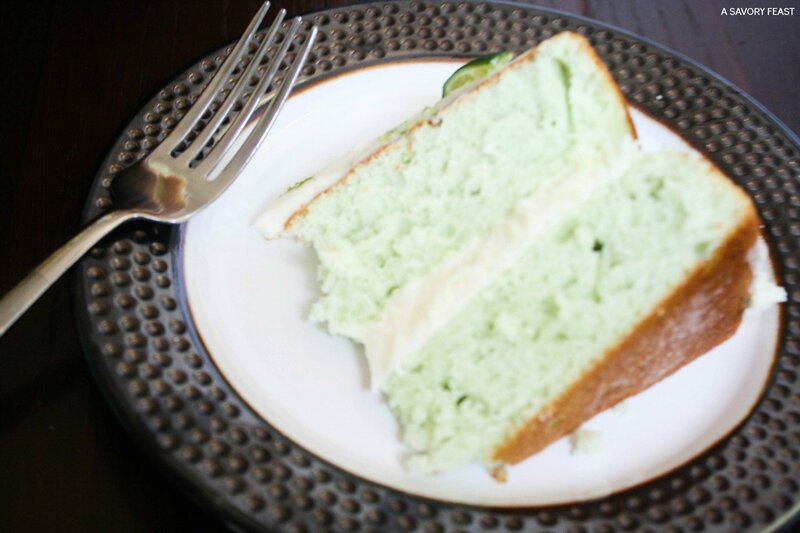 Key lime cake? Yes please! I crave lime sometimes so this might have to go on that list. That green is so pretty! I hope you win! I’ve been craving lime desserts lately. I think it has something to do with the arrival of the summer heat! 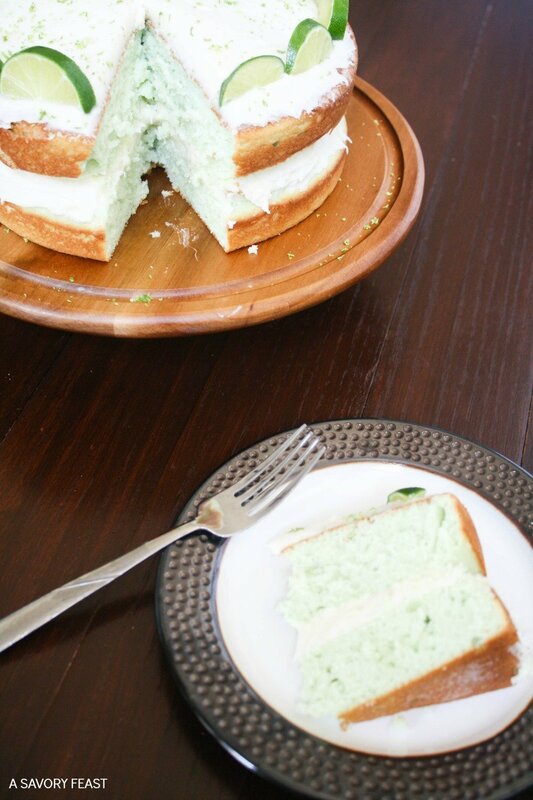 Ok, so living if Florida, I love key lime anything, and this cake sounds like the perfect treat for our hot afternoons! This is just the thing to beat the Florida heat! Enjoy. Hi Jenna, lovely cake, hope you’ll bring this on over to Food on Friday: Cakes over at my house (Carole’s Chatter)! Thanks, I’m glad you liked this cake! I am a Wayfair addict. like IT”S BAD. But in a good shopping way. This cakes is like WHOA. They have everything! I can go a little crazy on their site myself.